After doing the "Confessions of a Shoeaholic" tag video, I went back through my old photos trying to think of if I had ever posted an outfit with my beloved hot pink heels. It seems I haven't done a proper outfit post in so long that the neon beauties got left behind! It's a good thing I happened to take them to my trip to LA last year for IMATS along with my dear Kassia who makes photos magical. The biggest key to wearing such a loud statement shoe is to go neutral for the rest of the look. Grey tube dresses and flowing blouses make for breezy, comfy summer outfits that are refreshed by the bright heel. If you look closely, you can also see some subtle complimentary color blocking going on. blouse & dress shopAkira. purse Chanel. heels jgshoe. rings Forever 21, gift, and Etsy. Seeing these photos again reminds me of how much I miss summer. I'm dying for neons and pastels to hurry and make a comeback. I also need to bring back some color into my hair again. Should I ombre again or try something new? Let me know in the comments! Love the pink and I love your Chanel purse Jen! Very pretty, lovely colours!Gret photography too, with the bougenvillea flowers in the back and i love the pink french tips! I almost bought hot pink heels but ended up buying neon yellow ones lol! I LOVED this blog post. The outfit and hair photography was SO beautiful. You should definitely write more like this! I love your hair (color and style) in the 3rd picture! If that's the ombre, then I think you should do that again. Very pretty! What's the name of the shoes? And are they comfy? They are medium comfy. They actually don't slip off my heels so I love them! LOVE seeing your outfits! More posts like this, please! I LOVE absolutely everything in these pictures! it's so soft yet the pop of pink adds so much fun to the outfit! Jen I love that outfit. Cute idea laying a simple, basic tube dress with a pretty, feminine top..need that for summer ASAP! what a summery outfit...love your bag. 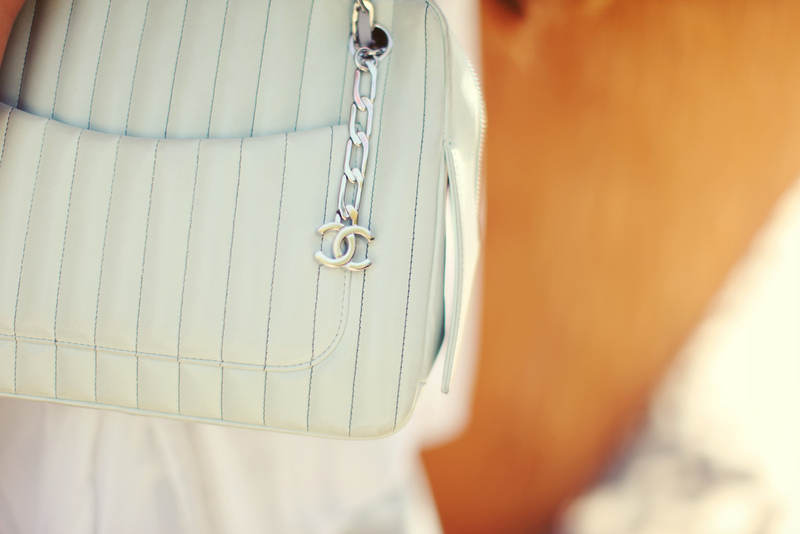 Gorgeous Chanel purse!! I love the color! i love the wash on all of kassia's photos, they all look like they've been lit up by the sunlight. so artistic! hi jen! are the pink and purple shoes comfortable? can you walk in them for long? Well, they aren't 1000% comfy like flats can be, but as far as heels go they aren't bad. I got them in 7cm and 9cm/2cm platform so the heel is easier to walk in. I could go to work all day in them but I sit at a computer. Hope that helps! I love your outfit!!!! You look gorgeous as always!!! Do you have any experience with Vince Camuto heels? The size 4 needs to run small for it to not slip off my slightly-smaller-than-size-4 feet. WOW Jen, nice outfit! I wish I can wear pumps too but the heel or ankle always slipped off on me :( It makes me so sad! BTW, I awarded you as the Versatile Blogger! :) I always love your YT videos & blog! I thought you said LV was your first designer bag. Whose Chanel purse is that? Hi ! I'm a size 33.5 like yourself & I would like to know which size do you order from jgshoes.com - the 33 or 34 ? I actually wear the size EU32/US2/210mm. i just followed u! u are gorgeous! and so is ur blog! loving ur style! please check out my blog & i hope that u will follow me too! 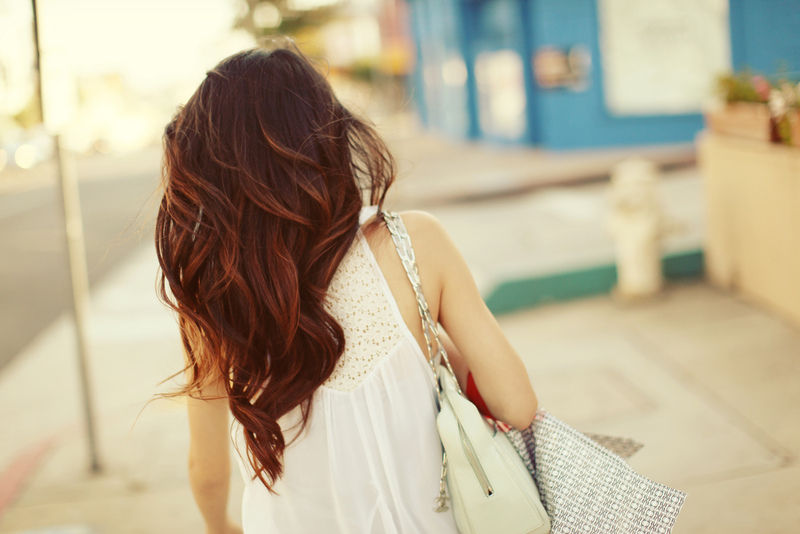 I absolutely love your ombre hair =) Cute outfit! cool matches... what is this series of Chanel bag.. it's gorgeous!